St. Mary's offers various methods by which parishioners can support her mission through various offerings and collections. Each method has unique recipients and benefits both to the giver and the parish. We strongly encourage electronic or "green" giving via Faith Direct. 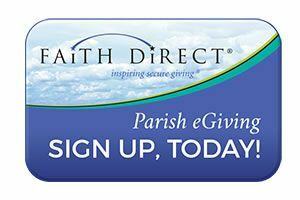 Through Faith Direct you can make all of your contributions to St. Mary’s Parish via automatic payment from your checking account or credit card. This is a great way to simplify your giving – and it’s the most cost-effective, environmentally-friendly way for us to receive your gifts. You can sign up for Faith by calling 1-866-507-8757 (toll free), by emailing info@faithdirect.net or by clicking the Faith Direct button above. St. Mary’s Church code is MD38. The Offertory, or Collection, at Mass is an integral part of the Sunday liturgy, not just because it is the primary means by which the parish receives financial support from the parishioners, but because it is also an expression of our gratitude to God for the blessings He has given us. Through our giving, we return a portion of them back to Him for use by His Church. By our baptism as Catholics, we are called to be stewards of God’s gifts to us, to use them in ways that build up our families, our parish, our community, and our world. We are encouraged to be deliberate and intentional in weighing our various obligations against our limited resources as we decide where we spend those resources of time and money and effort. When we give to our parish and to the greater Church, we are witnessing to our children and to the world about our values and about what is important to us. The weekly offering is to the parish what your paycheck is for your family. This is how the bills get paid: utility bills, insurance, salaries for clergy and staff, and all the other line items you see in the annual or quarterly financial reports. The weekly offering is the collection (the first one if there are two in any given week) taken up at Mass on Saturday or Sunday. Primary Building second floor hallway refinished. As Catholics, we are part of a universal Church that extends beyond our own parish boundaries. National second collections combine our resources to support important causes that carry out the mission of the Church. The tragedy of losing a loved one is difficult, but many families find comfort in honoring the life of those they have lost by requesting memorial contributions be made to St. Mary’s of Annapolis. Through memorial contributions, family, friends, and acquaintances can express their condolences with the positive action of supporting programs and services helping our students, our parishioners and the overall benefit of St. Mary’s.